No matter how hard you try to design something to abuse-proof, there’s always a way around it. – One cubic feet of lead traveling at 300 m/s in /that/ direction. – The severed head of the guy on the wanted sign. – A key to that really secure door over there. – Some highly compressed air in an almost-bursting container. – A piece of paper telling me the thoughts of the person I’m talking to. Is the process very fast? Can the object come into existence at some distance? Can I create a second item and thereby effectively destroy the first one? Can I make a very big flat object, if it only is very thin? 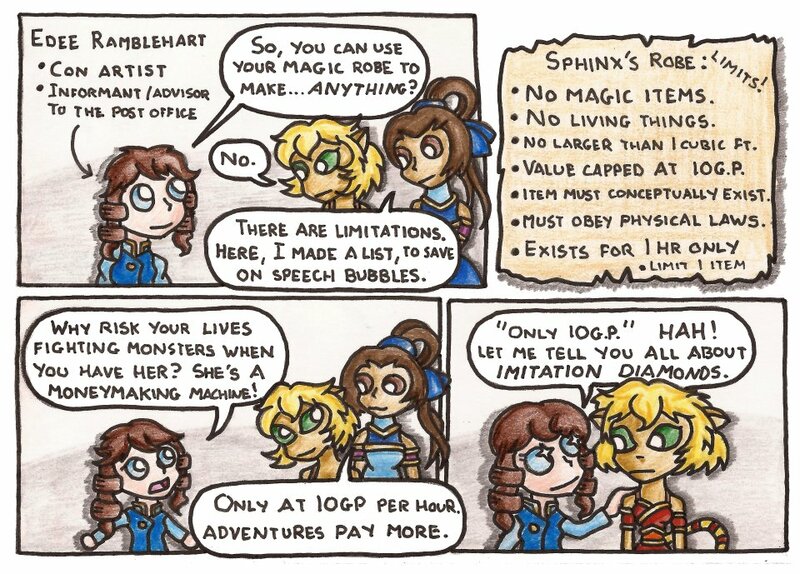 I love these, give a roleplayer a toy and they’ll immediately think of ten ways to break it that you didn’t think of. Some of these specific options are prohibited by the way the item works: for example you have to reach into the robe and remove the item, so you can’t generate velocity – and specific items (like “the key to that door” as opposed to “a key”) are explicitly prohibited in the item description… The paper would need some kind of magical process beyond the robe’s limits… But I had limited panel space for the list and didn’t want to make the comic too long. But you can totally do things like generate a generic “severed head” then use prestidigitation to make it look like the guy on the wanted sign, or pull out compressed air in unstable containers. Even with the limits in the item description, the abuses are near endless :) – or, if you have the severed head of a bandit, you could always generate a fake wanted poster with their likeness on it. My DM is in the corner despairing. I remember the good old days when our party would buy a load of 10ft ladders and break them down into two 10ft adventuring poles and a portion of firewood each.